on the Wuhan-Guangzhou route China’s high-speed rail system only opened in 2007. Even so it is slated to be bigger than the high-speed train systems of rest of the world combined by 2013. China is now the proud possessor of the world's longest high-speed railway network, with a combined track length of 7,531 kilometers as of December 2010. Before the Wenzhou crash in July 2011 official plans call for the network to expand to 8,000 miles (13,000 kilometers) by 2012 and 10,000 miles (16,000 kilometers) by 2020. China’s $300 billion high-speed rail network and state-of-the-art bullet trains are at the heart of China's "leapfrog development” plan. China’s high-speed rail system is one of the world’s largest and most costly public works projects. China had 13 high-speed railways in operation as of 2011, with 26 under construction and 23 more planned, although approvals of new projects were frozen following the Wenzhou crash. The general budget estimate for the Beijing-Shanghai high-speed railroad alone surpasses the entire budget for the Three Gorges Dam Project. Complaints about China's high-speed train program include the system’s high costs and pricey fares, the quality of construction and the allegation of self-dealing by a rail minister who was fired earlier this year on corruption grounds. on the Wuhan-Guangzhou route China spent more than $100 billion to build 12,000 kilometers of high speed railroad between 2005 and 2010. In 2005, work began on a 3,000 kilometer (1,900 mile) network of high speed trains capable of traveling between 200 and 300 kilometers per hour. The network will include lines between 1) Wuhan and Guangzhou; 2) Zhengzhou and Xian; 3) Beijing and Tianjin; 4) Hefei and Nanjing. The Wuhan-Guangzhou and Zhengzhou-Xian trains will be capable of traveling 300 kilometers per hour. In January 2010, Hong Kong approved an $8.6 billion high-speed rail link to China’s train network. In December 2010, a Chinese passenger train---the CRH-380A--- achieved a record speed of 486 kph on a test run of the track between Beijing and Shanghai. The Chinese said that it the fastest speed recorded by an unmodified conventional commercial train, A specially modified French TGV reached 574.8 kph in a 2007 test. A Japanese maglev train reached 581 kph in 2003. Railway official say they are working on technology to boost train speeds to 500 kph. The country's manufacturers seem positive that their trains will soon snap at the heels of the 574.8 km per hour world speed record set by France in 2007, an anonymous source with CSR Corporation, formerly known as the China South Locomotive and Rolling Stock Corporation, told the Xinhua News Agency Tuesday, during the seventh World Congress on High Speed Rail held in Beijing. 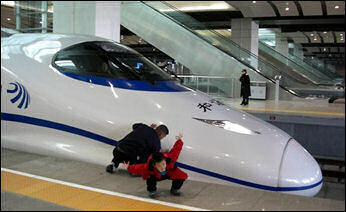 In December 2009, China unveiled what it said at the time was the fastest train in the world. It traveled between the southern economic hub of Guangzhou and the central city of Wuhan at an average speed of 350 kilometers per hour. A few days after it was introduced this train was brought to a screeching halt when a chain smoker lit up on a no-smoking train setting off a fire alarm, The train was still in a station and was stopped for 2½ hours while various safety checks were made. Zhang Shuguang, the deputy chief engineer of China’s railway ministry, said in a speech last September 2010that the government planned 42 lines by 2012, with 5,000 miles of track for passenger trains at 215 miles an hour and 3,000 miles of track for passenger and fast freight trains traveling 155 miles an hour...By comparison, the United States hopes to build its first high-speed rail line by 2014, an 84-mile route linking Tampa and Orlando, Florida. Top speed on this line is supposed to be 168 miles an hour. To avoid bulldozing urban neighborhoods, huge rail stations have been erected in industrial districts on the edge of cities. Subways to the stations are still being built in Guangzhou and Wuhan; passengers now take 40-minute bus rides from city centers. Sometransportation experts predict that a few of the 42 routes may not be finished until 2013 or 2014 as the stimulus money dries up. One worry is whether China is overinvesting in high-speed trains that may require operating subsidies like those for maintaining highways: fares on a route from Beijing to Tianjin have been set lower than initially forecast to make sure they stay full. CRH1 high speed train New Bullet-train-style train between Beijing and Tianjin in around half an hour and can reaches speeds of 120mph. Reserved seats cost about $5.50, double the price of slower trains that take about two hours. Improvements on the Guangzhou and Chongqing line have reduced the travel time from 28 hours to 21 hours. 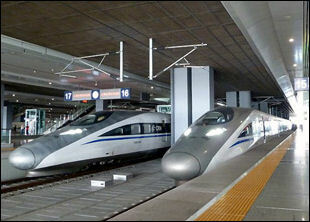 High speed trains are already competing with airlines, and airlines are losing customers When a new high-speed line opened up between Xian and Zhengzhou, airlines stopped all flights between the two cities as customers preferred the two-hour train ride costing to $57 to the 40-minute flight for $73. The three-hour train to Wuhan makes a quicker trip than the nearly two-hour flight, once faster train check-in times are accounted for. CRH2 high speed train High-speed trains modeled after the Japanese Shinkansen began operation are part of the route between Shanghai and Hangzhou and Nanjing in January 2007. New trains service between Shanghai and Suzhou cover the 85 kilometers in 39 minutes. The distance between Shanghai and Hangzhou is 171 kilometers and between Shanghai and Nanjing is 303 kilometers. The trains are capable of going 250 kilometers per hour but only go 160 kph because that is the maximum speed the tracks can handle. In October 2010, high-speed train service was launched between Shanghai and Hangzhou. The 200 kilometers distance between the cities is covered in 45 minutes. 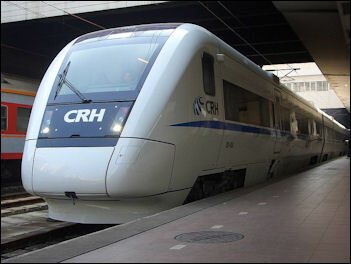 The CRH380 train, which operates on the line, has been clocked at almost 420 kph, a world record.. Although it will usually operate at a maximum speed of 350 kph. In December 2010, Liu Zhijun, the Chinese Railways Minister, declared that the eastern and central areas of the country have known an "era of high-speed railway," which will spread to western regions in the next five years, according to a national development blueprint, the People's Daily website reported. The railway ministry says the Beijing-Shanghai line cost 215 billion yuan ($32.5 billion)---$25,500 a meter. The railway ministry says the line will run 63 pairs of trains a day at 300 kph (190 mph) and 27 at 250 kph (155 mph). Ticket prices range from 1,750 yuan ($269) for a business class seat on the fastest train to 410 yuan ($63) for second-class on slower trains, compared to about 1,300 yuan for a flight. The initial plan was for 90 bullet trains a day in each direction. Originally there were plans to accelerate speed to 220 miles per hour by the summer of 2012, if the first year of operation goes smoothly. Even at the initial speeds, the new trains will take less than five hours to cover a distance comparable to New York to Atlanta ---which requires nearly 18 hours on Amtrak. The new trains are expected to provide stiff competition for airlines, whose the two-hour Beijing-Shanghai flights are subject to notorious delays, often caused by thunderstorms. Work on the line began in April 2008 and was not originally scheduled to be completed until next year. Then the global financial crisis kicked in and construction work was accelerated as the government's stimulus package channeled 4 trillion yuan into capital projects. The final stretch of track was laid in November 2010, just 31 months after the first foundations were dug. Construction was supposed to start much earlier and it was originally hoped the rail line would be completed for the Olympics in Beijing in 2008 but that didn’t happen partly because of delays caused by controversies over which technology to use and high costs. The project was expected to take five to 10 years to complete and cost $22.5 billion when the cost for real estate and resettlement are factored in. Initial tests in December 2010 set a record speed of 486.1 kilometres per hour, smashing the previous best for a conventional train of 416.6km/h, set during tests on the Shanghai-Hangzhou line. In January, the train recorded a new world's fastest speed at 486.3 km/h in a trial run. Mainland media made no attempt to hide their pride in the "domestic" high-speed rail technology that, although reliant on imported hardware, was then running faster than Japanese, Korean and European counterparts. It was originally intended that trains on the Beijing-Shanghai route would complete the 1,318-kilometre journey in less than four hours, with trains running at speeds of 350 kilometres per hour or more. Instead, trains will run at maximum speeds of either 300km/h or 250km/h, adding at least an hour to the trip. Although ministry officials have insisted the measure was taken to increase energy efficiency and allow for tickets to be more affordable, there have been widespread suggestions teh decision was prompted by safety fears. Tickets for the first trains - scheduled to leave Beijing South and Shanghai Hongqiao stations simultaneously at 3:00pm - sold out within 2-1/2 hours on Friday. The 1,750-yuan VIP tickets apparently sold out even more quickly than the cheap seats, as rail fans raced to be among the first to experience high-speed super luxury. 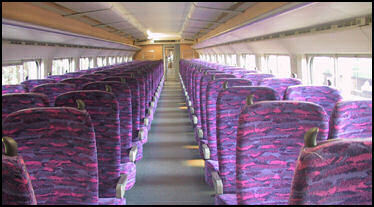 It was a different story for many of the 21 other trains running the route on the opening day, with scores of seats still available on almost all of them. 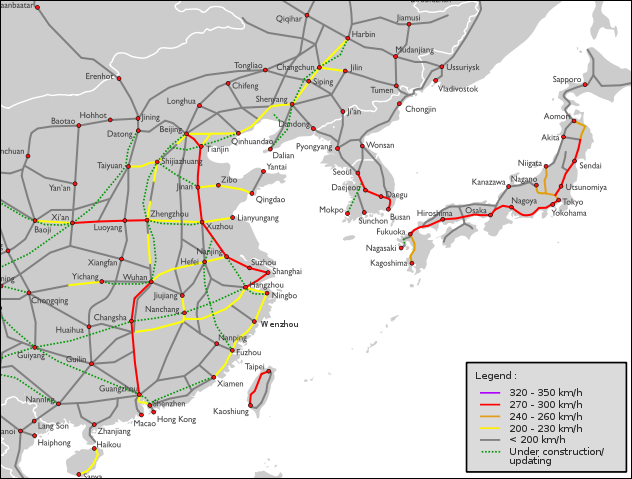 In 2010, according to the Washington Post, China invested $120 billion in high-sped railways. By one estimate construction of China’s rail system uses 20 million tons of steel and 120 million tons of concrete a year and provides 6 million jobs. France, Germany and Japan fought hard to win bids to build the Beijing-Nanjing-Shanghai high-speed railroad. In the early 2000s, the government said that it was 90 percent sure who it was going to choose but the reaction in the press and among ordinary Chinese was so negative the government decided to look at the issue again. When ground was broken in the Beijing-Shanghai high-speed railway in April 2008 no Japanese, French or German companies were named. The three main competitors were: 1) a six company Japanese consortium, including Kawasaki Heavy Industries, Mitsubishi and Hitachi, offering an upgraded version of the Hayate Shinkansen. ; 2) Germany’s industrial giant Siemens AG, which was trying to sell the high-speed InterCity Express trains; and 3) France’s Alstom SA, the French industrial firm that markets the TGV trains. 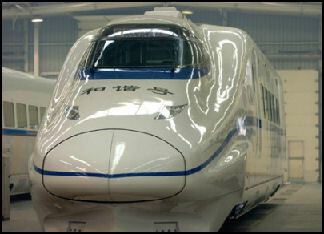 China produced its first domestically-developed, high-speed bullet train in December 2007. Capable of reaching speeds of 300 kph, the streamlined train boasts a lightweight, aluminum alloy body and will be used on the 115-kilometer line between Beijing and Tianjin. 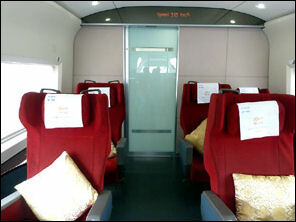 The eight-carriage train seats 600 passengers and should be operational before the 2008 Olympics in Beijing and the cut the travel between Beijing and Tianjin from 80 minutes to 30 minutes. 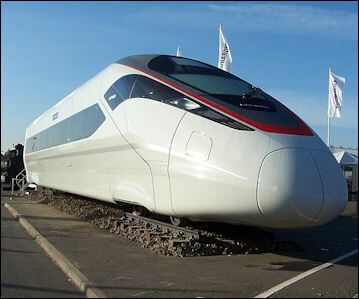 riding a high-speed train in 2011 China has started building railway tracks in Turkey, and has tried to make inroads in the United States, Russia, Britain and Brazil, among other countries. Arnold Schwarzenegger, the governor of California, expressed his interest in China's high-speed railway expertise during his visit in September 2010. The rail ministry and companies including China Railway Construction Corp. are among more than 900 firms that have expressed interest in bidding on work to build the planned 616- mile (991-kilometer) high-speed train line linking San Francisco and San Diego. A line under construction in Turkey is the showpiece for China Civil Engineering Corp, which hopes to win projects elsewhere in Europe. 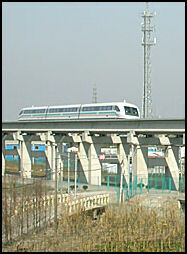 Shanghai's maglve train Shanghai is the home of the world’s first commercial magnetic levitation (maglev) train. Opened in early 2004 and built by German engineers at a cost of $1.2 billion, it reaches speeds of 260mph (415kph) and covers the 19 miles distance between Pudong International Airport to the 88-story Jin Mao Tower in downtown Shanghai in less than eight minutes. The maglev is regarded as a prestige project intended to boost the standing of Shanghai and China as whole, not make money. The stations look like futuristic lace tubes. The streamlined trains, which look like crosses between space-age fighters and conventional trains, hoover millimeters above a single gray track that is several stories above the ground and imbedded with powerful magnets that produce a faint humming when the trains pull in the stations. Passengers are told by a loudspeaker voice when they enter the train that they will be “flying without wings.” As the train accelerates there are few indications that the train is traveling extremely fast other than the buildings blurring by. You don’t even feel any vibrations until the train tops 400kph. The Chinese are so proud of the train they have even opened a little museum that explains how it works at downtown departure terminal. The trains depart every 15 to 20 minutes from 8:30am to 5:30pm, which means it often isn’t running when many flights arrive and depart. Tickets are $6 each way. Foreign tourist are thrilled by the ride, saying it is better than Disneyland. Business travelers and local people are less excited. They often just take a taxi from the airport, saying that is more convenient than taking the maglev downtown and working out a taxi or public transportation from there to their hotels or homes. They also complain about the long walk to the airport maglev terminal, the inconvenient times of operation and say the route isn’t very well marked. Prices have been slashed by a third to encourage more people to take it but still many people opt for other forms of transport. The train was built by Siemans AG and ThysseKrup AG. The company received permission to expand the train line, possibly to Hangzhou and Nanjing. If that is true the train would cover 300 kilometers and be built at a cost of $5 billion. Maglev on the move Maglev linear engines are powered by the interaction between superconducting magnets (made with a niobium-titanium alloy and cooled to near absolute zero with expensive liquid helium refrigeration systems) on the trains and magnets on the track. Each train magnet is simultaneously pushed by a magnet of the same polarity and pulled by a magnet of the opposite polarity on the side of the track. The polarity of the side magnets is constantly reversing and the speed in which they reverse determines the speed of the train. The train floats, creating virtually no friction, which allows the train to travel so fast. The repulsion of magnets of the same polarity on the train and the bottom of the track lifts the train above the track. The ride in a maglev train feels like the ride in an airplane. Problems with maglev trains include: 1) the incredible weight of the magnets and refrigeration systems, trains cars can weigh up to 100 tons; 2) the magnetic repulsion is inherently unstable because of the way the magnets repel one another so the guideway has to be perfectly smooth so the maglev train can float at a constant six inches above the track; 3) heavy shields are needed to protect passengers from the powerful magnets which can stop watches and pacemakers; 4) trains tend to move back and forth and up and down, an effect which can be dampened with shock absorbers. Building a maglev line is very expensive. The main expense is the elevated concrete guideway with embedded aluminum loops and magnets. The cost of liquid helium used as a coolant to create superconductivity is also very expensive. For the train to reach ultra-high speeds the track must be straight, and curves must be banked like those on a bobsled course. Limiting factors that prevent the train from reaching higher speeds are air resistance and tunnels. 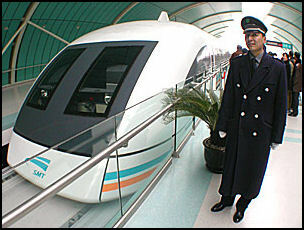 The Shanghai government has proposed spending $4.5 billion to expand the maglev train to Hangzhou. The project has outraged local citizens, for its cost, waste, the danger presented by such powerful electromagnetism, plans to route it through an area already filled with train lines and highways and its affect on property values. In some cases the value of apartments had dropped from $2 million to $160,000. In January 2008---after angry demonstrations by local residents were held despite official bans---the Shanghai government acknowledged there were problems with the project and promised to take into consideration public concerns---a rare recognition of the wishes of the masses. The Shanghai-Hangzhou corridor already has a new bullet train similar to Japan’s Shinkansen.